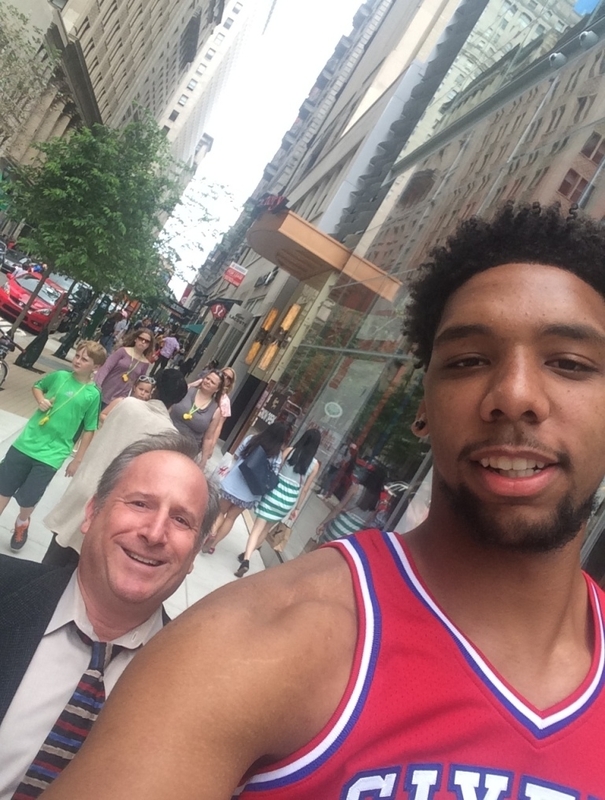 Shortly after the NBA draft I was walking to an appointment in Center City when I saw a tall guy, really tall, about 15, maybe 20 yards in front of me, surrounded by a handful of other people. Quickly, I realized that it was Jahlil Okafor, the 76ers recent first-round draft choice. He was taking a stroll through town, no doubt trying to familiarize himself with his new city. Those other people had stopped him for a selfie. Why not me? I caught up with him and, sheepishly, asked him for a selfie. He nodded, and as he did so, I was struck by an almost panicky concern of making the photo happen as efficiently as possible. I felt bad enough taking up his time. He was graciously taking selfies for people when I’m sure he would have preferred to walk around and explore the city unbothered. Under the best of circumstances it takes me a minute or two to shoot a selfie. I have to find the camera icon and then hit the reverse button. That’s a few moments, if I’m thinking fast. Next, I have to find a not unflattering perspective, which involves experimenting with angles and arm length, and it’s always more time-consuming than it needs to be because, of course, I never can remember what the best position is. Do I shoot from above or below? Tilt my head up or down? Lean it left or right? Finally, I have to take a few snaps and check them, to make sure I got one photo that looks okay. With Jahlil, there was going to be an added problem, a big added problem. He is two-feet taller than me. This was going to take some geometry. Would he squat down so we could both be in the frame? Could my arm stretch far enough to capture us both? While I was calculating all of this, Jahlil took the phone from my hand, used his long arm as a selfie stick, snapped the photo, and handed me back my phone, all in one smooth motion. He continued walking with his friends as I wished him luck for the season. I don’t know whether it was so effortless for him because he’s of the generation that is used to taking selfies, or he’s used to taking them because he’s asked to take them all the time, but it was impressive. I hope he is as smooth on the basketball court. Thanks, Jahlil, my new favorite Sixer. Good luck this season and with your career.